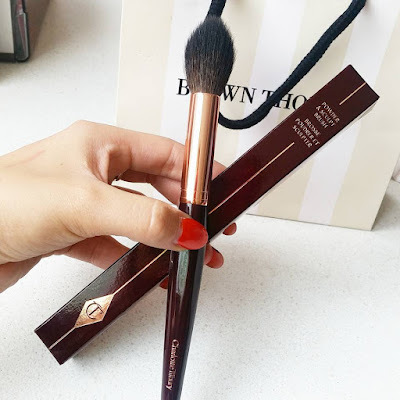 I got this Carlotte Tilbury Powder&Sculpt brush because the brush I was using for contouring became fluffy and round not tapered after about 3-5 times washing it, I couldn't get a precious contour with it anymore so I knew I need to invest money if I want the brush actually stay in the shape it is supposed to be,and this was the only brush I could find that was exactly how I wanted it to be. I washed this few times already and it did not fluff out or became round it stayed in shape and still does when I clean it, so if you need a good brush for contour definitely worth looking at this one the hair on the brush isn't rough too and it doesn't scratch your face when you use it, because some brushes do that. I would 100% repurchase this if something happened to it or i lost it. Or order it from The Brown Thomas website, Retail price 45euro.